Global economic uncertainty, new competitors invading local markets, new regulations, fluctuating raw material prices, demographic changes, major weather events and new technology are all elements of risk that are now a part of our daily reality but that are difficult to anticipate and whose impacts are difficult to predict. Many such risks seem to be more of a concern to large enterprises. However, it is important to keep an eye on these risks since they will eventually have an impact on SMEs. Some of the risks that have more of an impact on SMEs include the inability to obtain financing, difficulties in recruiting and retaining specialized personnel, being evicted from leased premises, or a drastic increase in rent following the arrival of a major retailer, family disputes, business successions, the loss of a major client, a rigged bidding process, inventory theft, and fraud. Even one of these risks can pose a serious threat to the financial stability of an enterprise and can even cause its demise. These risks are very difficult to manage once the event has occurred. In such cases, mechanisms must be put into place to deal with the situation. Nonetheless, the best way to address these risks is to anticipate them so as to be able to take timely action. By investing in a risk management program, you give yourself a chance to prepare for these situations, to minimize their impacts and even to turn them into opportunities. 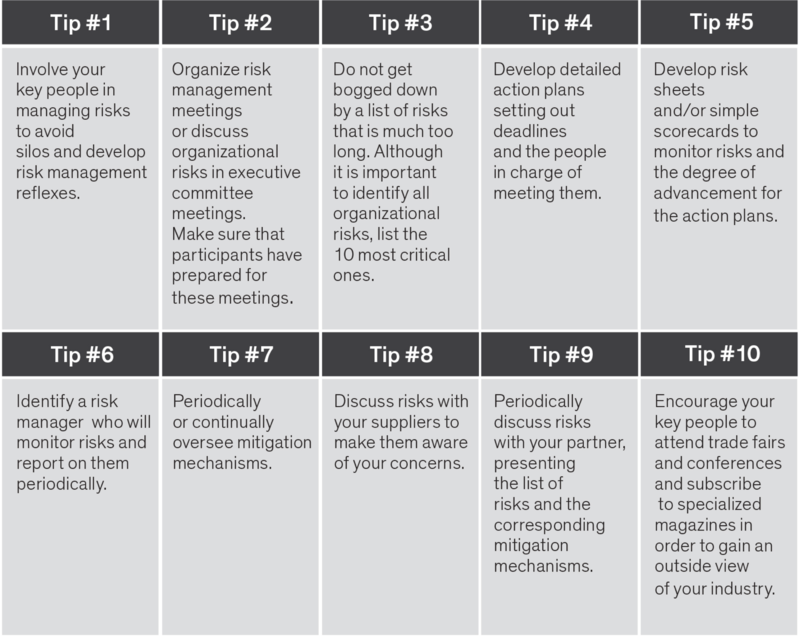 For the past several years, risk management practices have become much more structured. A number of recognized organizations, in particular the Committee of Sponsoring Organisations of the Treadway Commission (COSO) and the International Standards Organisation (ISO), have proposed master plans to help businesses develop risk management programs. This approach obviously requires time and a certain control structure. However, several practical solutions exist to allow SMEs to develop their risk management program. Risk management acts as a watchdog for your company since it allows everyone to take some time and question all internal business processes in addition to the external environment. When risk management is well developed, it goes beyond a simple list of risks and mitigation mechanisms, leaving room to develop a risk culture that will make employees more aware of the threats that companies face.